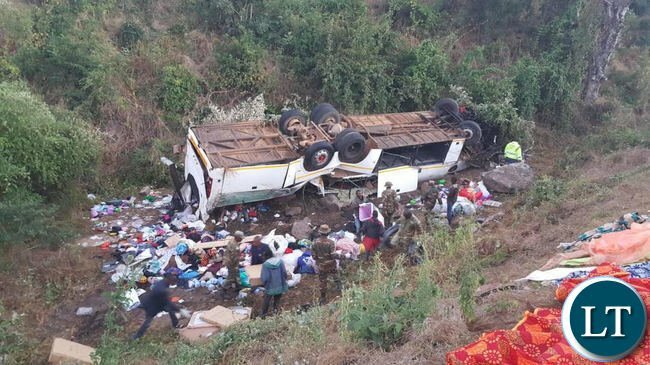 THE Road Transport and Safety Agency (RTSA) will take punitive action against the proprietor of Kapena Bus Services following the death of 19 passengers on board on one of its buses involved in a road accident at a time when it should not have been travelling. Another 46 passengers were left injured. RTSA observed that this was not the first time the buses owned by Kapena, abrogated the ban on night travel. The accident happened between Luangwa Market and the Luangwa Bridge around 21:08 hours, minutes past the last hour by which public service operators must park their buses. The ban came into effect following increased road traffic accidents involving public service buses which led to a ban on Mazhandu Family Bus Services after an accident on the Great North Road which killed 10 travelers, earlier this year. In yesterday’s tragic accident, the driver of the Scania bus, registration number ABP 6303, lost control of the East-bound vehicle and overturned as he failed to negotiate a curve around Kacholola area, a bend considered tricky to negotiate even in daylight. Frequent travellers of the route say it is not uncommon for some carriers to ask passengers to disembark while they negotiate the curve. The injured people were receiving treatment at Mumpashya and Katondwe Mission hospitals. Police spokesperson Esther Katongo confirmed the accident in a statement yesterday. Ms Katongo said among the dead were three juveniles, six male adults and eight female adults. The driver of the bus, identified by Ms Katongo, as Matomola Mubyana of SOS area in Lusaka, was among the injured. “The bodies are being transported to the two mentioned hospital mortuaries,” she said. Ms Katongo said all the bodies of the deceased had been transferred to Chongwe District hospital. In another statement, RTSA head of public relations Fredrick Mubanga said action would be taken against Kapena Bus Services for failure to ensure the bus and fleet crew operated within the provisions of the law. Mr Mubanga said Mr Mubyana and the operator defied the provisions of Statutory Instrument (SI) number 76 of 2016, which restricted the movement of Public Service Vehicles (PSV) at night. “It has been established that Kapena Bus Services has on several occasions been operating outside the provisions of SI number 76 and the agency has on several instances warned and impounded the operator for violating the law,” Mr Mubanga said. He urged travelers to report any violations of the SI to avoid road traffic accidents and that the people should refuse being commuted outside the approved driving hours under the law. People died in Manchester more than this and it hasn’t been politically been charged to this extent. Is this UPND wanting attention again ? I feel like throwing up. Could someone please pass me the pike bucket ? I have a PhD now. “RTSA observed that this was not the first time the buses owned by Kapena, abrogated the ban on night travel”……….did you have to wait for people to die in order for you to take action? We’ve heard a story of how one RATSA officer exposed a scheme in which a famous bus operator was using one bus to get fitness for his fleet by only changing the number plate on that one bus……….instead of revoking the licence of the bus operator, the RATSA officer was suspended because the bus operator is apparently “well connected”. On Zambian roads most drivers think they are super dupa dudes who can drive fast. If you overtake them ninshi wabatuka. Ask any Zambian who drives about a maximum speed they have reached before. You will some say 200km/h or 180km/h or 210km/h. I drove in our highways, mamamamahhh… these guys run indeed whereby they overtake you on a bend or while an on coming vehicle is visible and near but the on coming car gives way for them. That is my obersavation in Zambia. unfortunately I have lost most friend due to car accident. Make LSK to KBW a dual carriage way please. Mushota, even in U.K. the politicians have paused campaigning due to the terror attack that killed 22. If that is not a political matter then what is it. The only problem in our once beloved country is that they culprits in this case, law enforcers, are conniving with the perpetrators of the law. Talk of the IG being on someone’s payroll! Miss Katongo you have the information of law breaking and been paid to ignore and now many lives are dead. I am afraid your actions are too late. You cannot bring those lost lives back! You shame me! Before we start blaming the bus driver and the fact that he was driving in the night, just pause for a second. Just how safe are the Zambian roads? A few weeks ago I watched a video clip of a “Ride from Kabwe to Lusaka by road”. What that video reveals is disheartening. There are no road markings, no traffic signs for caution, sharp curves or speed limits, zero traffic lights, no off ramps for cars exiting the free way, no pedestrian crossing signs, etc. The only time I saw traffic lights was when the driver taking the clip was approaching Lusaka. Most long distance coaches travel through the night to avoid delays from other road users. Who on earth is even constructing these roads. Im sure we are paying them huge amounts of money for such cheap so-called roads. What is a pike bucket people of the Lord? Will PF return all the bribes/donations these Bus companies pay PF? Useless and corrupt RTSA! We have heard those pronouncements before. Every time innocent people are killed by these rickety and worthless buses, you always let the culprits get away with this heinous crimes. You always benefit from these accidents by getting bribes from the bus operators. You bunch of criminals! The report above from LT is not factual. There is no single bend on the Great East Road where passengers are asked to disembark for drivers to negotiate a bend. Total Lie. Its sad that lives have been lost though. Also there is a person on this blog whose mental status appears to be unstable as this person is bringing in political parties in all this. Such id10ts must be kept away from blogging please. Throw up already, you are so full of shiit. “RTSA to take action against the proprietor of Kapena Bus Services that killed 19 people”. All this, is PF government making without effective decision making ethos. How does PF wholesomely lift up the night ban driving of passenger busses without in-built safety measures. Which drivers went for re-training and what regulatory measures of night driving have been put in place?. PF government prides in deaths of innocent Zambians by focusing on money over human life. Others have said it here before. RTSA is reactive and not proactive. This needless loss of lives could have been prevented. RTSA is slowly evolving into ZP. It is very sad that UPND have a tendency to celebrate the death and suffering of people. GBM should have been in that bus. UPND cadres be humble from now on. Another coward id10t calling himself by a fake name called kudos vomiting nonsense. Camaradie, there is a reason why the brain is in your head and not in your ntwenu, use it please. …IT IS ALSO DISAPPOINTING THAT NOT EVEN THE GOVERNMENT HAS TAKEN ACTION TO GET RID OF RTSA. IT WAS EVEN SHOCKING THAT THE PREVIOUS BUS OPERATER WON THE CASE AND THE GOVERNMENT WAS JUST LOOKING. I WOULD ADVISE THE GOVERNMENT TO TAKE ACTION OR ELSE WE EXPECT MORE ACCIDENT OF THIS NATURE TO FOLLOW ON. BECAUSE, THERE’S NO DETTERENT ACTION WHICH HAS EVER BEEN TAKEN ON THE PART OF GOVERNMENT. CORRUPTION IN GOVERNMENT DEPARTMENTS IS KILLING ZAMBIA. THE WORST PART OF ZAMBIANS IS THAT THEY ARE SO ADAMANT/DOCILE THAT THEY WILL CONTINUE TO USE THE SAME BUSES THAT ARE DEATH TRAPS. IN OTHER COUNTRIES CONSUMMERS BOYCOAT A SERVICE OR GOOD FROM BUSINESSES THAT MOCK CUSTOMERS- IN THIS CASE THE SERVICE THAT KILL THEM. CONSUMMERS THEMSELVES IF GOVERNMENT OR RTSA IN THIS CASE ARE NOT TAKING ACTION CAN STOP USING THAT SERVICE. CONSUMMERS MUST KNOW THAT ACCIDENTS DUE TO INCOMPETENCE WILL NEVER STOP UNTIL CONSUMERS THEMSELVES STOP TRAVELLING ON THOSE BUSES. YOU WILL BE BURRYING FRIENDS AND RELATIVES IN MASS-GRAVES EVERY IF YOU DON’T TAKE ACTION AGAINST OFFENDING BUSINESSES IF YOU DON’T STOP USING THOSE BUSES. TERRIBLE IN ZAMBIA. AND YOU ARE PROMOTING TOURISM- IT’S A SHAME. QUOTE FROM ZAMBIA DAILY MAIL: “And RTSA head of public relations Frederick Mubanga said investigations conducted so far have established that the bus driver and the operator defied the provisions of SI 76 which restricts movement of public service vehicles at night. MEANING RTSA HAS BEEN EATING BRIBES WHILE WONNING THE BUS COMPANY. THEY CHOSE TO TAKE BRIBES INSTEAD OF PROTECTING PEOPLES’ LIVES. WATCH THIS SPACE- THIS BUS COMPANY WILL BE OPERATING, AGAIN. You failed to run Zambia Airways ,failed to run Zambia Railways and now even the road sector is badly run and regulated resulting in such high human toll. If you have lost a loved one, you have every right to sue the operator and RTSA for criminal negligence. When citizens sue, things tend to improve. If you accept everything as either acts of God or the devil, nothing will change! @7 YOU CAN’T BE FAR FROM THE TRUTH. ZAMBIA IN AFRICA MAY BE THE HIGHEST AS FAR AS ROAD DEATHS INVOLVING MAINLY BUSES, AND OTHER VEHICLES ARE CONCERNED. THIS IS DUE TO HIGH LEVELS OF CORRUPTION IN GOVERNMENT INSTITUTIONS. RELATIVES AND FRIENDS MUST SUE RTSA AND THE BUS COMPANY IN MILLIONS OF DOLLARS FOR THESE DEATHS. THEY WILL NOT BRING BACK LOVED ONES. BUT, IT WILL BE A LESSON ESPECIALLY ON RTSA, BUS COMPANIES AND THE GOVERNMENT THAT HAS LET THIS ROT TO GO ON. You have to be stiff with punishment or else the bus operators will not learn a lesson.In fact,let families of the deceased be compansented large amount of money.Further, any affected passenger has be given money. These stupid bus operators are taking passengers for granted.Secondly,passengers should not risk by travelling during banned hours. OPEN QUESTION TO ZAMBIA POLICE SPOKES PERSON. What do the police do at check points spread through out the country. my argument is, if a bus for example is going to Lusaka from Chipata and it reaches Petauke at for instance 19:00 hours, it is common sense that the bus will not make it to Lusaka by 21, mean while the police would allow it to police. then who has instigated the accident? to me it is the police at the last check point the bus was allowed to go. Fact, just the other day, i was waiting for a colleague who was coming from Lusaka a CR bus, he told me they were in Ndola at around 2130 and they reached Kitwe at 22:45. How did pass through the check point at Kafulafuta and Luangwa. The question is what do these give the Police? Where is the blood of Jesus to cover the bus, because it is the norm nowadays for some quack pastor to pray in the bus for it to travel safely. Whilst this happens accidents happen every time in a Christian nation. No! It’s because our continent is shaped like a question mark! ? see! We don’t know whether we coming or going. Zambia is stagnated due to illegal political the housekeeping taking place in the country. Correction—>No! It’s because our continent is shaped like a question mark! ? see! We don’t know whether we coming or going. Zambia is stagnated due to the illegal political housekeeping taking place in the country. Mushota i try not to respond to you but in this instance you blog bringing politics is disgusting. Zambians are a respectful nation where is your respect for the dead and injured. U have the audacity to complain about pipo referrring to you election/erection mistake. An educated person without respect but then again the scots are an arrogant bombastic bunch. RATSA at it again. I know the bus which leaves intercity at 1500 hrs will not reach Chipata before 2100. But RATSA official at intercity clears the bus to go. After kiiling people you turn around and want to punish the operator, Before punishing the operator first fire those RATSA officials who clears the bus to go. The bus bus is not9 a hotel for you to start assuming will sleep in the bus at 2100 hrs wherever 2100 hrs finds them. Zambia is tired of these pathetic failures ati ‘ Kapena bus operator has on SEVERAL occasions been operating outside the law’. What do you expect from an illegitimate regime? state house is cerebrating and heaping it on UPND as the cause of accidents. More Zambians are yet to die. Senseless destruction of precious human life. MTSRIP. I hope there will be stiff punishments for all those who culpable in this negligence – though that lawyer from Kabwe may be looking for an opportunity for quick bucks. Also, Reporter: The distance between Luangwa Market and Luangwa Bridge is about two kilometers – Kacholola should not be mentioned here. Usually, there is a Police Check Point just before the market, and at the bridge. Clearly, these drivers know how corrupt our police system is and they do this all the time. Will people please start effecting citizens’ arrests. So sad. So this Kacholola curve is still a killer in Zambian hey! So many people have perished in road traffic accidents there but we never seem to learn, it’s like the wildebeests of Serengeti at a crocodile infested river crossing, they will never stop despite being killed there for centuries. Maybe Lungu should try his “sikokoshi bump dance” with HH at the Kacholola curve, that could be the one thing that can teach him one hell of a Dununa Reverse lesson, mambala! The bus was traveling to Eastern Province. RATSA and Police should take their fair share of the blame. The bus passed the roadblock and the police let it through without inspecting if everyone was wearing a functional seatbelt and alcohol testing the driver. I doubt if RATSA has proper guidelines on the safety standards for the buses to run on our roads. If that bus had a proper roll over protection and people wearing seatbelts, I am sure the fatalities would not have been this much. Some of these bus builders have two standards. One to run in SA with proper roll over protection and another to run in the rest of Africa without roll over protection. It’s actually shocking that these buses have fitness certificates even when the seats inside don’t have seatbelts. Shocking indeed. By RTSA’s own admission, they knew this operator had problems but did nothing until lives have been lost. Does RTSA want government to engage expatriates to get the right things done? It is very obvious that our own locals are failing. Maybe we should disband the entire RTSA and Police Traffic division and engage expatriates. Something must be done before lawlessness on our roads gets to what we see in some neighboring countries. We can do better than this! RATSA and Zambian Traffic Police are just heaps of dog SH.IT! What meaningful and action can they really take? They temporarily revoked the license from Mazhandu as a show case BUT then quickly gave it back to them to kill more people after RATSA was bribed by PF cadre Ngulube!! So again, surely Ngulube will get the license back for Kapena and make more money for himself! Just disband RATSA and get an international body to manage Zambian Roads – Zambians can never ever manage the roads properly because they too corrupt. The problem here is that RTSA is just in too much Comfort Zone and its management has gone to sleep for so long. How can we be experiencing so many fatal road accidents when there is an angency that oversee the safety of the citizens? Just take a look at how minibus drivers behave on the roads, its time a shake up qas done at RTSA and new one appointed. The new management must draw up a safety strategy instead of just talk shows. There’s technology that RTSA has ignored to minimise these fatal horrors. See how ZRA is working now, brilliantly and the same must be extended to public Universities, Schools, Hospitals, Councils and RTSA itself. We need excellent services from these institutions. Is it not the same spot where KOBBS bus service (Zambia – Malawi) killed another bunch of people on 10 October 2009. You remember the Katomdwe Secondary School PTA bus accident? I hear to date, relatives of those who died and the injured have not yet been compensated after 7 years. RSTA should put up a speed mechanism of having people compensated. Questionable Legal and Judicial process at play.